September 30, 2015 By This post may contain affiliate links. This post brought to you by Campbell’s Soup Company . The content and opinions expressed below are that of Hungry Happenings. 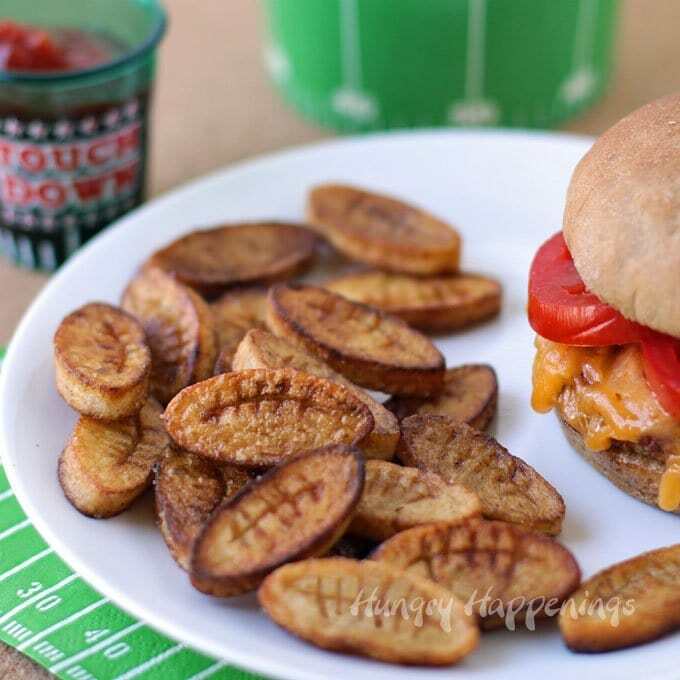 Football fans will cheer when you serve these fun French Fry Footballs and you’ll be happy to see how easy they are to make using potatoes and Swanson® Broth. For those of you who are looking for a fun side dish to serve before the big game, these cool looking fries are perfect. Imagine serving up some juicy burgers, brats or BBQ alongside a generous helping of these crispy little football shaped French fries. What football fan wouldn’t love them? Making these fries is pretty simple, but I found the trick to keeping them crispy on the outside, fluffy on the inside, and full of flavor. I blanched them in some Swanson® Chicken Broth before pan frying them. Wow, what a difference it makes. 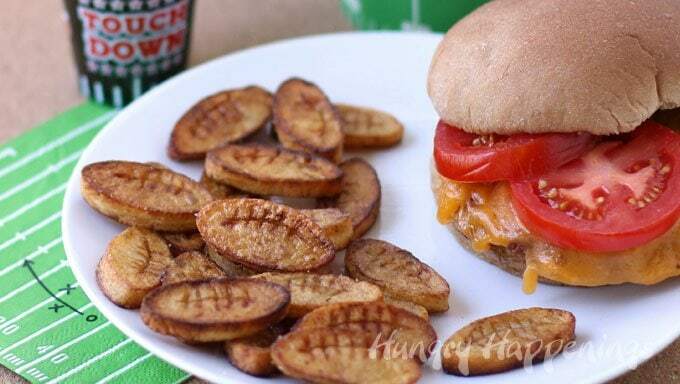 To make your own batch of Football French Fries, you’ll want to slice russet potatoes about 1/4 of an inch thick then use a small oval cookie cutter to create the football shaped potatoes. I actually bent the ends of my oval cutter so that it had a better football shape. Then to really make the potatoes look like footballs, you’ll want to use a toothpick to carve lines that look like the laces. Dig deep enough that you see the laces well, but not so deep that you cut through the potato slice. Being these fries and fairly thin and pretty small they could have easily gotten very dried out, but by blanching them in some Swanson® Chicken Broth first, they really stayed moist and tender. Plus, being the broth is made with chicken, vegetables, herbs and spices, it really adds a wonderful flavor to the fries. Have you seen the new containers of Swanson® Broth? They have screw top caps which close tightly so you can store the box in the refrigerator without worrying about spilling broth all over and they have measuring strips along the side so you easy judge how much broth to pour into the pan. I used about 2 cups of broth so that I could fill my pan and cover the potatoes completely. You’ll want to add the broth to the pan, then add the potatoes and bring it to a boil. Then lower the heat to low and allow the potatoes to cook for 10-15 minutes until firm but tender. Remove the potatoes and pat them dry with paper towels. Melt a tablespoon of butter along with 1 1/2 tablespoons oil in a large skillet then add one layer of potatoes. Cook for about 4 minutes on each side until golden brown. Remove and set on a paper towel. Sprinkle with salt and they are ready to serve. If you want to make these in advance of your party, just reheat them at 400 degrees Fahrenheit until warmed through, about for 6-10 minutes. I was given product samples and compensated by Campbell’s Soup Company in order to create and share this recipe with you. I hope you give it a try and let me know how you like these fun Football French Fries. Be sure to check out other delicious Campbell’s recipes at Campell’s Kitchen. You can follow Campbell’s Swanson Broth on Facebook and Instagram @SwansonBroths. Crispy little football shaped French Fries. Peel and slice potato into 1/4 inch thick slices. 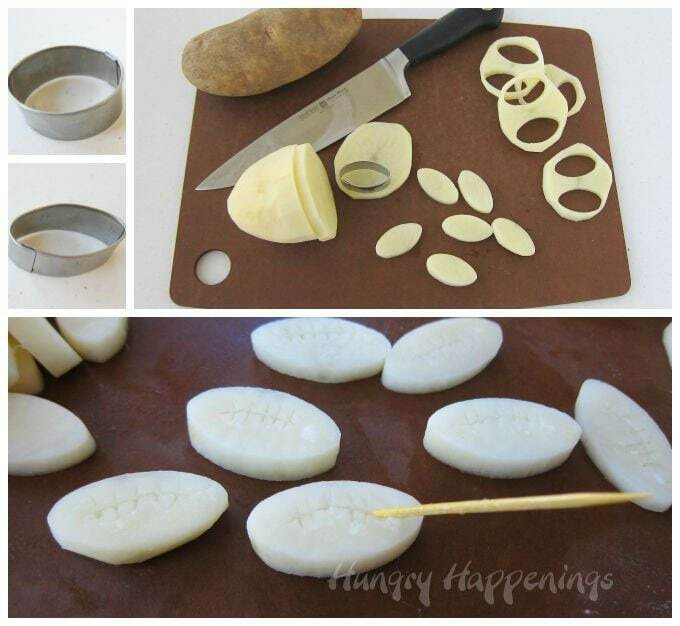 Use a toothpick to carve the football laces in each potato. 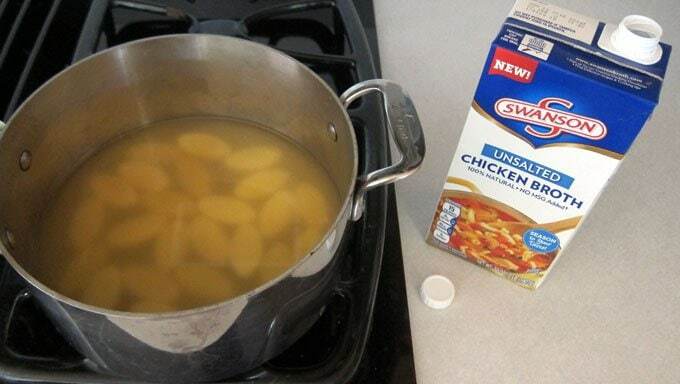 Pour Swanson® Chicken Broth into 3 quart pan. Heat on high until the broth comes to a boil then lower heat to low and simmer for 10-15 minutes until the potatoes are tender. 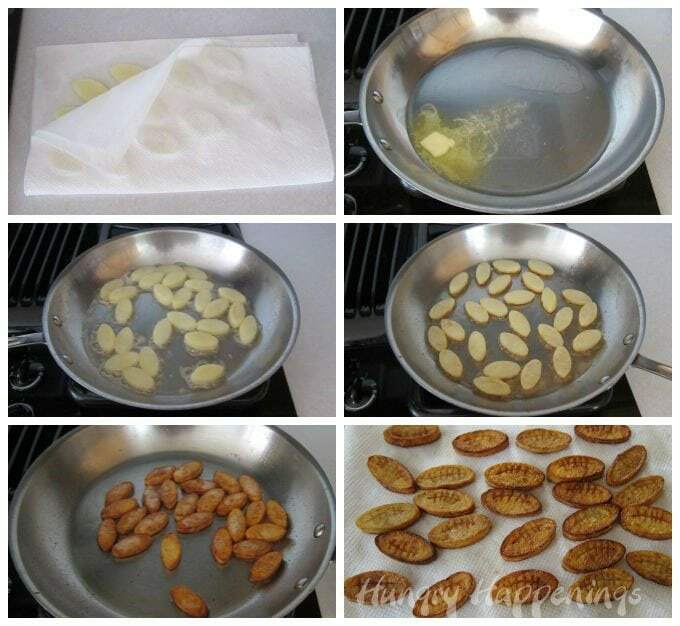 Remove and pat potatoes dry with a paper towel. Melt 1 tablespoon butter and 1 1/2 tablespoons oil in a 12 inch skillet set over medium heat. Add a single layer of potatoes to the pan and cook for about 4 minutes on each side until golden brown. Repeat, heating the remaining butter and oil and frying the remaining potatoes. If needed, reheat in a 400 degree oven for 6-10 minutes. holy flippin’ fries these are AWESOME Beth! :>D! I would score some major points if I served these football French fries. They would be perfect for game day! Yes, you would! I know your hubby would love snacking on these during the game.